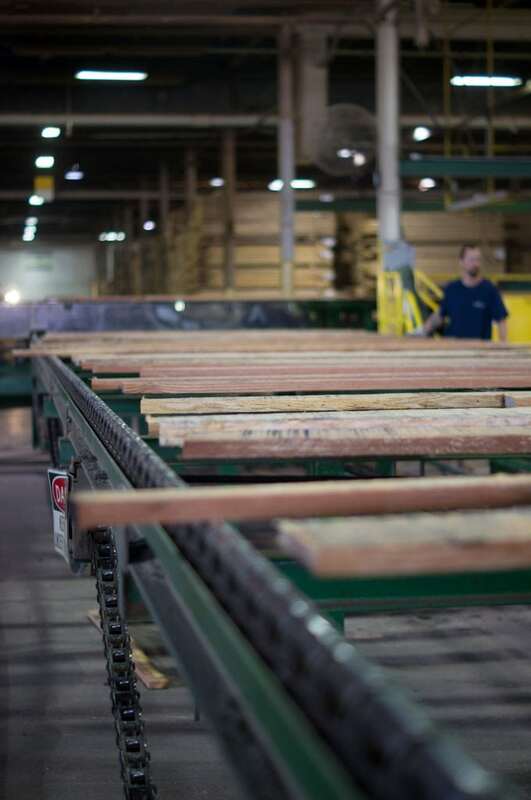 Our sawmill produces the finest quartersawn American hardwood lumbers and plainsawn lumbers, including white oak, red oak, cherry, hard maple, and walnut. American hardwoods have entered their fourth century of providing beauty and authenticity, warmth and integrity, lasting aesthetic and functional value to interiors. For floors, furniture, moulding, millwork and cabinetry, they are quintessentially green materials in abundant and self-renewing supply. Click here to see our latest stock list. 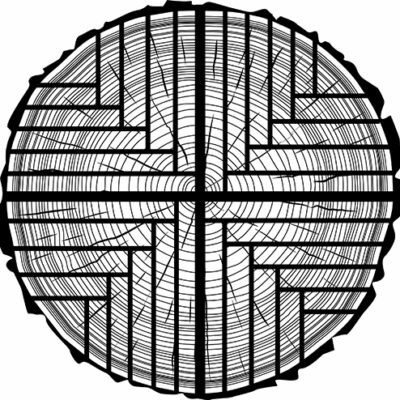 In quartersawn white and red oak, a visual distinction is made between “quartered” and “rift.” Red and white oak have, as part of their biology, large bands of radial calls called “medullary rays” which emanate outward from the center of the log, similar to the spokes of a wheel. These redial cells transmit water and nutrients outward as the tree grows. While all trees have medullary rays, they are most pronounced in the oaks and to lesser degrees in the other hardwoods. Quartered boards exhibit the most pronounced figure, generally having growth rings at a 60-90 degree angle to the face of the board. As shown in the image below, quartered boards are typically the first two boards from each face of the quarter log (A, B, 1, 2). Rift boards exhibit a straight-grained and less-figured appearance, with growth rings at a 30-60 degree angle to the face of the board. As shown in the image below, rift boards come from cuts C-E, and 3-5. Rift boards typically display less fleck than quartered boards. The quartersawing process reveals the beautiful and uniquely distinctive appearance of these rays, which is referred to as “figure.” In quartersawn white and red oak, the medullary rays literally jump off the face of the board when stained and finished. It is this sparkle that makes quartersawn lumber the preferred choice for architectural and design projects of distinction. All quartersawn boards share one common characteristic: the growth rings manifest themselves on the face of the board as straight grain. The principal benefit of our quartersawing technique is that all of the grain will be straight, showing none of the “cathedral grain” traits of plainsawing. This straight grain also permits edge gluing for width, while maintaining a consistent appearance across the face of the board. Frank Miller Lumber also manufactures a high volume of plainsawn lumber. Plainsawn hardwood boards are produced by cutting tangentially to a tree’s growth rings, creating the familiar “flame-shaped” or “cathedral” pattern. This method also produces the most lumber from each log, making plainsawn lumber a cost-effective design choice. 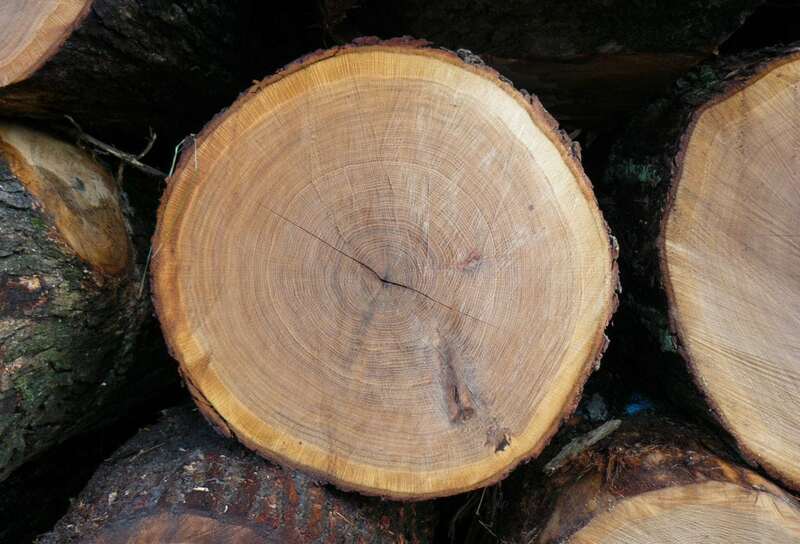 Quartersawn lumber has the growth rings of the tree approximately perpendicular to the board’s broad face. 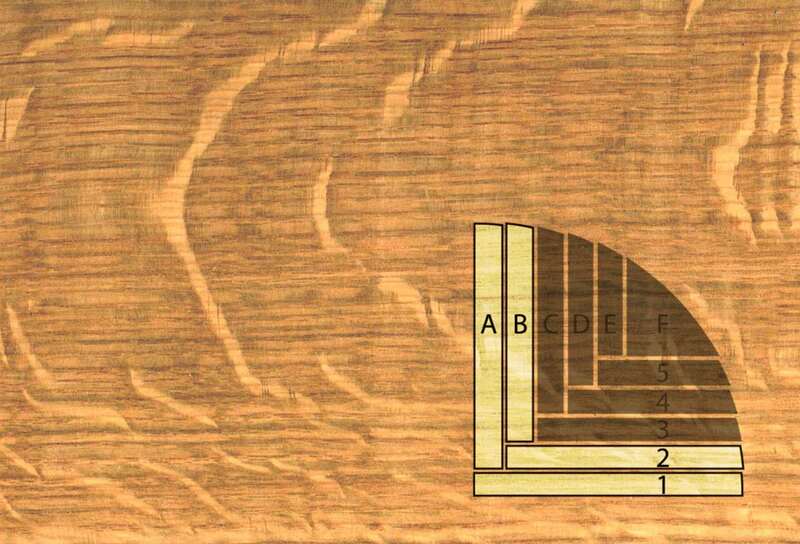 In contrast, plainsawn lumber has the growth rings parallel to the board’s broad face. All hardwood boards absorb and shed water to some degree, even when finished. Quartersawn hardwoods will usually only shrink and swell in thickness, allowing it to stay flat and stable. This makes quatrtersawn hardwoods the perfect choice for cabinetry, flooring, furniture and millwork. Quartersawn hardwood — white and red oak, cherry, hard maple, walnut, hickory — is beautiful. It is characterized by a distinctive, straight-grain appearance along with the warm and appealing patterns of medullary ray. Medullary Rays are the channels in every tree through which moisture and nutrients travel outward to feed the tree as it grows. 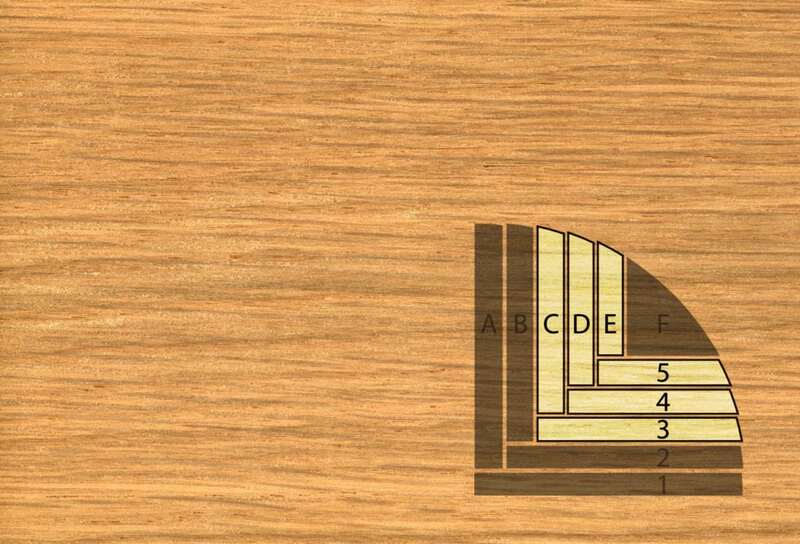 In quartersawing the medullary rays run along the face of the board, perpendicular to the growth rings. In some species these Medullary Rays are almost microscopic in size, while they are very pronounced in Red and White Oak. When stained, the medullary ray “figure” imparts a sparkle, lifting it off the softly radiant face of the board. For the architect and designer, this results in distinctively beautiful, straight grain hardwood lumber of unsurpassed quality. Quartersawn red and white oaks are chosen for their useful characteristics as well as for their elegant appearance. 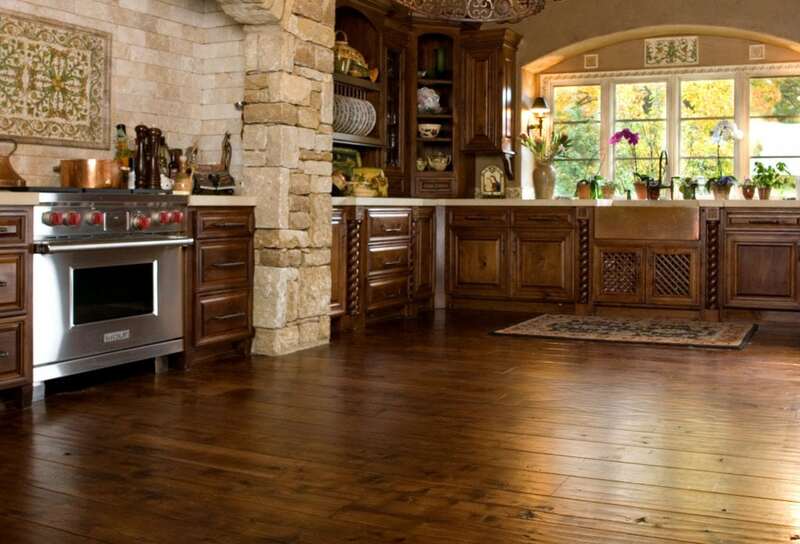 All hardwood will absorb and shed moisture, depending on its environment, over the entirety of its service life. This natural process can result in wood movement. The quartersawing process itself makes the lumber more stable. Unlike plainsawn hardwood, quartersawn hardwood tends to expand and contract in thickness, not width, because of its straight grain. Additionally, warping, twisting and cupping are virtually eliminated, thereby enhancing stability. This makes straight grain quartersawn hardwood a perfect material choice for flooring (even over radiant heat), entry and interior door construction, cabinetry, millwork and built-ins. 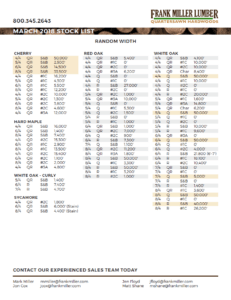 Quartersawn white and red oak score high on the Janka Hardness Scale, which measures the ability of a wood species to withstand denting and wear. 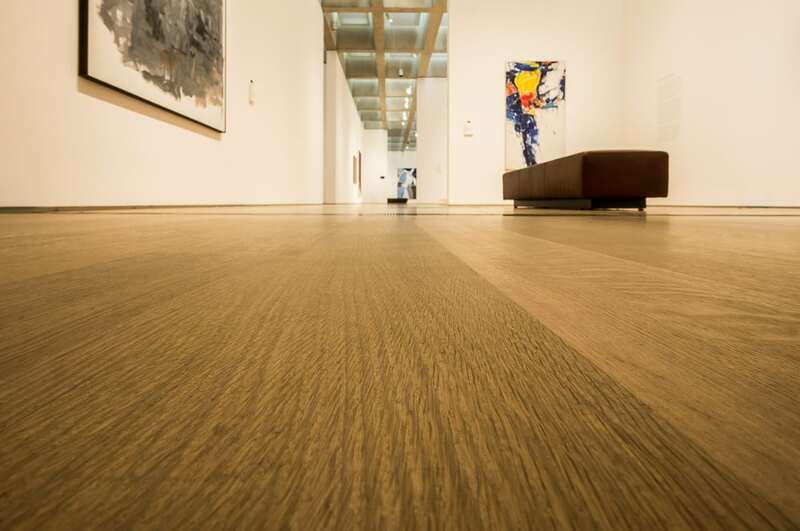 Thus, users and specifiers can be assured of the lumber’s durability for a long service life as flooring. 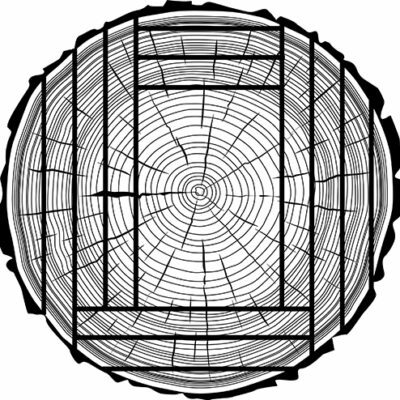 The Janka Scale measures the force required to embed an 11.28 mm (0.444 in) steel ball into wood to half its diameter. This method was chosen so that the result would leave an indentation 100 mm2 (0.16 sq in) in size. It is one of the best measures of the ability of a wood species to withstand denting and wear. It is also a good indicator of how hard a species is to saw or nail.